So Kim, Billy, Alison and I were standing around in downtown Palo Alto around 10:30 today after a brief visit to the farmer's market. We wanted to do something, go somewhere, see something cool, but what? Somehow the idea came up that we should drive to Monterey and Carmel and poke around there. So about 1/2 hour later we were in my car speeding to our destination. We stopped at the Baja Cantina for a tasty lunch (I highly recommend the place, but if you don't believe me, check out these other reviews). 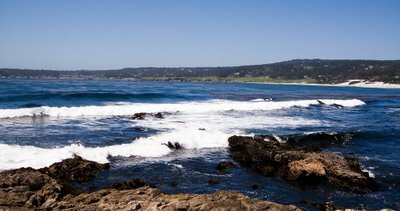 We then drove around Carmel looking for a spot to park (spectacularly unsuccessfully might I add). We managed to stop briefly for a quick view of the beach and the spectacular waves. Oh yea did I mention you get a 3 for 1 special today? I couldn't stop myself with just one little picture. On our way out of Carmel we spotted this mission (turns out it is the San Carlos Borromeo de Carmelo Mission). There is a graveyard in the back (in where I got a couple of interesting pictures that I am in the process of editing and posting in my California Gallery). Curiously the graveyard has very old graves (as in 18th century) as well as much newer ones (as in the 1980s); I wonder what it takes to get a grave there. Also, since there was a wedding going on in there today we didn't get a chance to take a peek inside. Which makes me wonder what it takes to get a wedding there as well. Someone I suspect mucho $$$ might be involved. 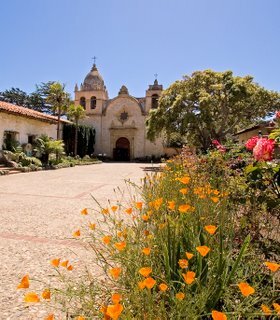 After my somewhat morbid photographing session in the graveyard we continued on our little road trip towards Monterey. Cannery Row is a famous tourist attraction in Monterey. Its basically a street with a beach tons of restaurants and various other tourist traps. We walked up and down the street before getting bored and leaving. 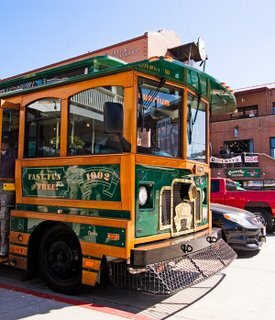 Oh yea and Monterey has those funky trolleys like San Francisco for the tourists to get around (though San Francisco's trolleys are much cooler). On our way out of Monterey we found the Old Fisherman's Wharf and walked up and down the boardwalk (Kim saw some people fishing and got all excited). We eventually managed to get back on the highway and make it back home. All in all it was a day well spent doing nothing. The weather was just gorgeous with not a single cloud in the sky. Now I'm tired. Good night. Canon 30D, 10-22@22mm, f/8, 1/500s, ISO 100, cropped, output sharpening. Canon 30D, 10-22@10mm, f/8, 1/800s, ISO 200, cropped, shadow highlight, curves, output sharpening. Canon 30D, 10-22@15mm, f/8, 1/160s, ISO 200, cropped, shadow/highlight, curves, output sharpening. Sounds like a cool way to spend what could have been a hot day. Nice work with the camera - you're good with the snapping.